HOW DO YOU INTRODUCE THE DALEKS? Perhaps as the first aliens to appear in Doctor Who, if you discount the as yet unnamed Time Lords. Maybe as an iconic piece of 1960s design by Raymond Cusick, which would spread ‘Dalekmania’ through multiple television appearances, films, and copious amounts of merchandise. Perhaps you’d describe them as the last survivors of the Kaled race, mutated by war, and further mutated by Davros using chemical and ionising radiation. If they call us mutations, what must they be like? A mutation is a spontaneous, random change in the amount, arrangement or structure of DNA, in genes or in chromosomes. A mutagen is something that increases the chance of mutation occurring. In this case, chemicals and ionising radiation are the mutagens. They both primarily cause mutation by forming free radicals, or highly reactive substances missing an electron which cause mutation. One of the main ways they are created is from water. The human body is around 70% water, and presumably the Kaleds are similar. These mutagens, especially radiation, can cause water to be split into a hydrogen ion, an electron, and a hydroxyl radical, which is an oxygen atom and a hydrogen atom bonded, but missing an electron. The hydroxyl radical is incredibly reactive, and will react with any biological molecule in the body. It removes an electron to replace its own, leaving behind the molecule it reacted with as another free radical. It can react with protein, fat, or most dangerously, DNA. This can create a variety of products and outcomes, from one or both DNA strands breaking, the formation of pairs missing bases, or incorrect bases being substituted. These are gene mutations. Our chemical weapons had already started to produce genetic mutations. Chromosome mutations can also occur, such as chromosome loss and gain, where cell division occurs incorrectly, or inversions, translocations and more, where bits of chromosome move to incorrect places in the chromosome. Two hydroxyl radicals can then react to become hydrogen peroxide (H2O2), which via the Fenton reaction, forms another hydroxyl radical and a hydroxide (OH–). Hydrogen peroxide needs iron II to perform this, and so it can diffuse throughout the cell, and spread damage to many parts of the cell when it meets iron II. As iron is often is associated with DNA in cells, this means that DNA is often exposed to these free radicals. 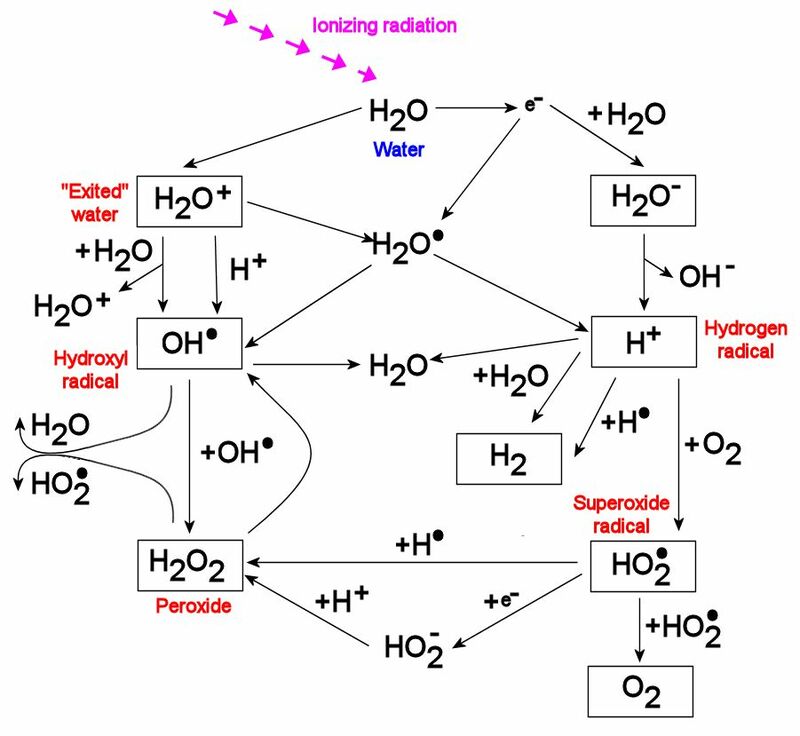 Superoxide radicals (an oxygen molecule with an extra electron), formed from hydrogen peroxide or the electron transport chain, restart the process by reforming iron II from iron III, so it can decompose more H2O2. The damage to DNA can change gene expression, or which proteins are formed, that can lead to degenerative conditions such as cancer and accelerated aging, but can also be beneficial, and contribute to evolution, by developing useful traits. These can build up over generations by selection, in this case, artificial. For Davros, this would be a remarkably inefficient system of genetically engineering a supreme warrior race, because as the definition states, the process is random, and detrimental mutations are much more likely to crop up than beneficial ones. A much more efficient method would be to use gene editing enzymes, such as the recently discovered CRISPR/Cas9 (Clustered Regularly Interspersed Palindromic Repeats, associated protein nine – part of an adaptive immunity system found in some bacteria). The Cas9 enzyme cuts DNA, targeting a specific segment due to guide RNA inserted in the complex, and then using a DNA template, another gene can be inserted in its place. This would allow for a much more effective development of a species, which is also energetically cheaper and also quicker than using radiation. The biological principles used are however correct, so while Davros’s judgement can be called into question, his method is relatively realistic. Genetic mutation with radiation and chemicals does occur, but there could be no control of these mutations. After a war lasting a millennium, it may have become difficult for Davros to lay his hands on gene editing equipment, and radiation from the war may be all he had left. Saying that, the creation of hand mines would still have required advanced technologies of this kind, and would have existed while Davros was young. Whatever the case, the Daleks would be much more likely to have died from genetic disorders before they could conquer the universe.